Russell County has multiple layers of healthcare by virtue of a major hospital system in the region and two substantial family medical clinics operating within its borders. The hospital systems and clinics in our county are listed below. Both of the major hospital systems shown above have tertiary hospitals in Northeast Tennessee that are classified as Level 1 Trauma Centers. The hospitals are also acute-care teaching facilities affiliated with East Tennessee State University Quillen College of Medicine. Read more about the hospital systems below. The MSHA-operated Russell County Medical Center is located right in the Town of Lebanon in Russell County. Wellmont Urgent Care in the Town of Lebanon. Ballad Health operates a family of 21 hospitals, including a dedicated children’s hospital, community hospitals, three critical access hospitals, a behavioral health hospital, an addiction treatment facility, long-term care facilities, home care and hospice services, retail pharmacies, outpatient services and a comprehensive medical management corporation. Clinch Valley Medical Center, part of LifePoint Health, is located in neighboring Tazewell County and also provides general medical and surgical care in the region. In Russell County itself, 20 physicians and four dentists maintain practices. More than 200 physicians and about 50 dentists serve the extended seven-county, one-city e-Region of Southwest Virginia. Both Holston Valley Medical Center (Kingsport) and Johnson City Medical Center in the nearby Tri-Cities were ranked among the top 10 hospitals in Tennessee by U.S. News & World Report in 2014. The facilities are located about an hour’s drive from Russell County and managed by major hospital systems that serve Southwest Virginia. 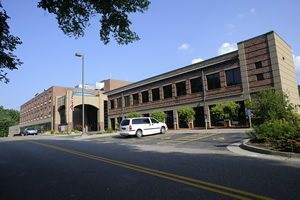 The Southwest Virginia Cancer Center in Norton, Virginia, is part of the larger Wellmont Cancer Institute, which provides the latest in oncology treatments and services in the region. Kissito Healthcare Maple Grove, the only skilled rehab and nursing home facility in Russell County, holds Medicare’s prestigious 5-STAR Rating – a designation achieved by only about 10 percent of all nursing homes in the country.